Make sure that the surface of your finish is clean and free of any dirt. If not, clean it with a mild soap like Murphy’s Oil Soap and water. Take a piece of lint free soft cotton cloth and put a lump of paste wax in the center of the cloth. This will limit the amount of wax you apply to the surface and you need not have to continue to dip into the can. Twist the cloth into a ball and kneed it in your hand to soften the wax a little. Apply the cloth over the surface of the finish letting the wax seep through the cloth onto the surface. You can apply the wax in any direction, using any motion, straight, circular, with grain, against grain etc. When the wax is first applied, it glossy because of the amount of solvent in it. As the solvent evaporates, it will start to turn back to solid and the surface will become hazy. If you wait too long the wax will be difficult to remove. If this happens, don’t worry, just take some fresh wax apply it over the hardened wax and wipe it off right away. The solvent in the fresh wax will re soften the hard wax again and you can remove it. If you don’t wait long enough, you will still be removing all the wax and you will have no sheen at all. Work on small areas at a time until you get used to how long you need to wait until the wax has hazed and the excess needs to be removed. 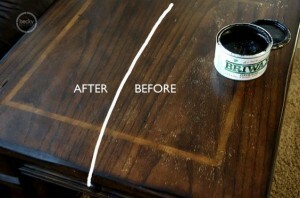 Wipe off the excess with a clean piece of lint free soft cotton cloth. Buff the surface with the cloth until you achieve an even sheen. If you are worried about hurting your furniture, don’t. There is only two things you can do wrong and neither of them will ruin your furniture. You can put on too much wax and it will take longer to remove, and not give the wax enough time to dry. If you have any questions about taking care of your furniture feel free to call Exceptional Cleaning or visit us online at www.atlantaexceptionalcleaning.com and schedule your house cleaning today.